The popular rookie linebacker, who will start on Sunday in place of the injured K.J. Wright, made strides this preseason once he stopped demanding perfection and started trusting himself. Shaquem Griffin will make his first NFL career start Sunday. Because he earned it, but not by himself. The 6-foot, 227-pound rookie linebacker — who will start against the Broncos in place of injured veteran K.J. Wright — attributes part of his preparation this week to standout middle linebacker Bobby Wagner, who has paired nearly every practice rep with a pre-snap pop quiz. “He asks me so many questions throughout the play, so I was forced to learn,” Griffin said Friday. “With him, each play he’ll ask me what (responsibilities) I got, and I’ll tell him. He already knows what I need to do. He just wants to see if I’ll answer correctly. Of course, comfort has never been an issue between Shaquem and his twin brother, second-year Seahawks cornerback Shaquill Griffin. When it comes to criticism, neither brother is afraid to be blunt. Shaquill also isn’t afraid to demand a physical demonstration. 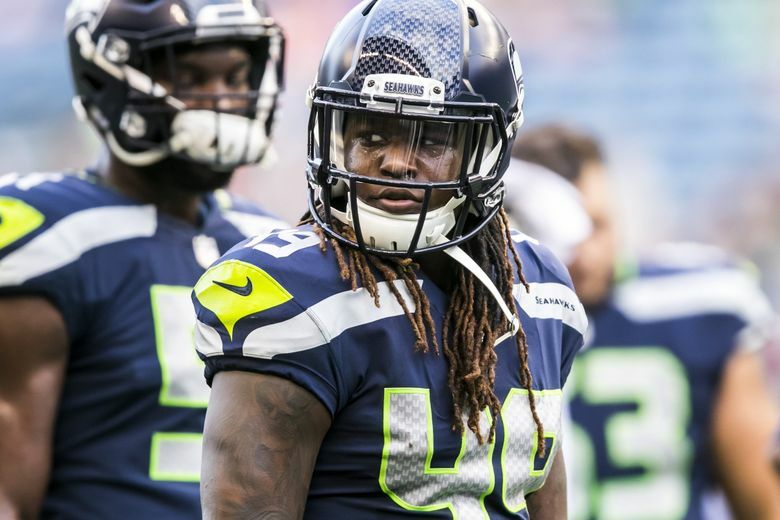 “He’s the hardest critic on me,” Shaquem Griffin said. “A lot of guys talk to me and they tell me what I do wrong, but they kind of (dance) around it. Added Seahawks coach Pete Carroll: “I know (Shaquill) looks after him and they look after each other and they’ve got a level of communication that I would think most of us can’t understand. They are so supportive and loving to each other, but they’re tough on each other as well and demanding of one another. Naturally, Shaquem wants to succeed for his brother. He wants to succeed for Wagner. He wants to succeed for the organization that drafted him and all the kids who have related to the remarkable rookie’s story. But in the preseason, that pressure to succeed — to be perfect — took its toll. The Central Florida alum struggled in the Seahawks’ 24-14 defeat against the Los Angeles Chargers on Aug. 18, finishing with just three tackles after leading the team with nine the week before. “He was tight. He wanted to please everybody. He was just trying to do too much stuff,” Carroll said. “We simplified it, got his language really clearer, what he was intending on trying to get done – like making his drops, making his reads and stuff, just simplifying things. And he’s a really good ball player, so he just took to it. Shaquem echoed that sentiment Friday, when the rookie linebacker — who produced 24 tackles in four exhibition games — called this his most complete week of practice. Because of Wagner. Because of Shaquill. Because of his coaches. Because he let go of unrealistic expectations. What Shaquem Griffin can’t control, the 2017 second-team all-American has learned, is the spotlight that surrounds him seemingly everywhere he goes. Since being named Peach Bowl MVP in January, earning a late invitation to the NFL combine in March and being selected in the fifth round of April’s NFL draft, Griffin — whose left hand was amputated at age 4 — has instantly become one of the league’s most widely recognized rookies. And yet, at 23 years old, Shaquem seems capable of shouldering it. Sunday, he’ll start in his first NFL game because of a lot of people … and for a lot of people. “Each and every game, I know I’m playing for more than just myself and my family,” Shaquem said. “I’m playing for a lot of people, and I take that with me every single game. Me being able to do that and me being able to keep that on my shoulders has allowed me to push harder even when I feel like I’m tired or I can’t feel my legs (during a lift).